In 1901, cows and people were finding their way into Great and Little Quitticus Ponds in Lakeville, much to the dismay of the City of New Bedford which since 1899 had used the two bodies of water as a municipal water supply. The chief engineer at the city's pumping station on Negus Way in Rochester kept a vigilant eye out for violators of the prohibition which barred from the pond and surrounding lands trespassers (many of whom came by the trolley which ran along Lakeside Avenue to picnic by the side of the pond). The apparently poorly-worded reporting of one New Bedford correspondent, however, seems to have implied that the local cows were due for watching, as well. "It seems only fair to warn the said cows and people that go out on the trolley cars that their actions along the shores of Quittacus can no longer be kept hidden from the eye of the engineer, now that he has got a telescope to look through." Probably the cows don't pay fares, but hook their rides. The telescope mentioned in the report had been purchased at a cost of $60 and installed in the pumping station in March, 1901, "so that wandering cows and picnickers [sic] on the shore of the pond can be observed." View of Lake Pocksha, Middleboro, Mass., John H. Frank, Middleborough, publisher, postcard, c. 1910. 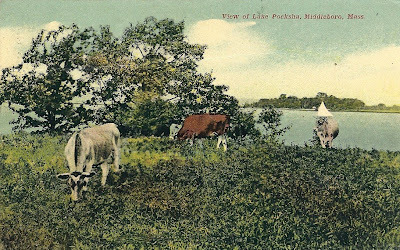 Apparently the cows seen grazing the shores of Pocksha Pond in Middleborough in this postcard were better behaved than their counterparts in Lakeville. The City of Taunton seemed less concerned than New Bedford that local cattle might find their way into the neighboring pond. Old Colony Memorial, "News Notes", March 16, 1901, page 3, and April 6, 1901, page 3.